First time visitors to Paris rarely stray beyond the Luxembourg into the southern hinterland of Montparnasse. None of the iconic sights of Paris are to be found here and as a quartier it is quite large - however, for the discerning and determined explorer of the city, Montparnasse has its own unique delights, one of them being the increasingly popular catacombs. From the Ney statue the avenue Denfert-Rochereau stretches in an arrow straight line to Place Denfert-Rochereau where a massive lion is arising from its plinth now situated between terrifying steams of traffic; when Frédérick Bartholdi placed his mighty sculpture here at the end of the 1800's the area was one of horses and carts and the lion was more accessible. The sculpture commemorates the heroism of Colonel Denfert-Rochereau who fought heroically during the Franco-Prussian War of 1870 and there is a larger model in sandstone in Belfort and a smaller version in Montreal of all places. Bartholdi of course went on to sculpt the far more famous Statue of Liberty. However, most visitors are too intent on searching for the éntree to the catacombs to take much notice of the Lion of Belfort but usually come across the queues which snake around many corners, before they spot the entrance within a square shaped building. In its own way the building is more interesting than the catacombs themselves being one of two barrières surviving in the area. There are more than a few coincidences concerning the catacombs - the barrière which is now the entrance to the catacombs was situated at the end of a road called rue d'Enfer and was subsequently called the barrière d'Enfer and since Enfer is the French word for Hell, it was therefore to Parisians Hell's Gate. 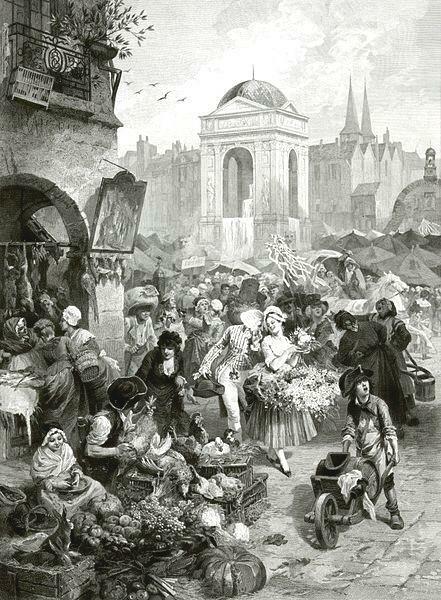 Built in the mid-1700's, the barrière 's true purpose was to collect taxes from farmers bringing their goods into the city and connected by a wall which surrounded the city there were over 50 of these tollgates. Needless to say, the tollgates were hated by Parisians, so much so that on the 12th July. 1789, 40 of them were destroyed by rioting crowds - a prelude to the storming of the Bastille which took place two days later. It takes a great stretch of the imagination to believe that the origins of the catacombs are in the Beaubourg/ Les Halles area of the city, a cheery place where tourists and locals mingle in the bars and shops, in an atmosphere of joie de vivre. But the fact remains that the Church of Les Saints- Innocents stood here nearly 1,000 years and for most of that time this was the burial ground for most of the city of Paris. The renaissance gem which is La Fontaine des Innocents, is the only reminder of the area's medieval past and even that only dates from 1549, which makes it a comparative newcomer. The cemetery of the church was the main burial ground for most of the surrounding area and as time went by and the population of Paris increased the mass graves could hardly accommodate the influx of cadavers which increased greatly whenever there was war or pestilence. It's difficult to believe that the population of the quartier lived and worked so close to the burial ground but death in all its forms was more common then and the cemetery of Les Innocents was an integral part of the area so much so that it was here that the expression danse macabre came about, spawning medieval images of skeletons with scythes, grinning skulls, hooded ghosts and clawing hands reaching out to the young which have come down to us via horror comics and novels and are most apparent on Halloween - it was then as now a way of laughing in the face of the Grim Reaper. Following 600 years of burials which increasingly taxed the ingenuity of the church authorities to find space for the increasing flow of bodies, the ground level had risen to an incredible 8 foot above the pavement of the neighbouring rue St Denis and to the dismay of the neighbouring householders some of the bodies could actually be seen emerging from the soil. The event which forced the authorities to finally take action took place in a Brewery on rue de la Lingerie when the Brewer went down to his double layer of cellars and was faced with a scenario which was the stuff of nightmares - there in the cellars were hundreds and hundreds of bodies in various states of decay scattered throughout the rooms, with more slowly tumbling through the walls which had disintegrated under the weight of soil from the neighbouring cemetery. In a seemingly unrelated happening four years later in 1784, a gardener going about his business fell into a deep pit which had opened without warning near to the site of present day Denfert-Rochereau, with subsequent excavations finding the ground to be a labyrinth of subterranean stone quarries. In one of those light-bulb moments an unknown member of the council saw the connection between the problems at Les Innocents and the tunnels beneath the barrière and began a process which would see Les Innocents transformed into the enjoyable area it is today and the creation of the Paris catacombs. In 1786, led by priests carrying lit torches and followed at the rear by a municipal official on horseback , the first convoy of bodies from Les Innocents were trundled along the cobbled streets in the dead of night to be placed in the depths of the old quarries. Year after year the process went on until an estimated 6 million bodies had been transported to what is hopefully their last resting place, tastefully arranged in row after row of skulls and bones and separated into the original parishes they had originated from in Les Innocents. Many strange things have taken place in the catacombs over the years - there have been parties thrown by aristocrats and others by Punks, the French Resistance had a headquarters here and one or two unfortunates have been lost never to be seen again. 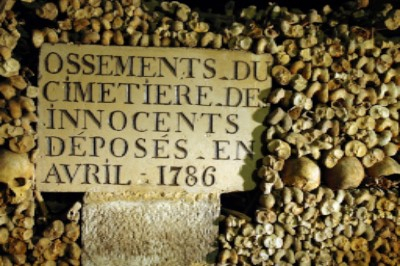 The catacombs have become an irrestible place of pilgrimage for anyone who has the merest interest in the supernatural and the crowds have increased tenfold since I first went there many years ago. I vividly recall the chilling sign "C'est Ici L'Empire de la Mort ." There was also another sign at the ticket-office which gave a list of rules and regulations -- No Smoking, No Littering, No Small Children and so on - and the final one written at the bottom of the sign put everything into perspective when it stated unequivocally "No Dogs Allowed !" 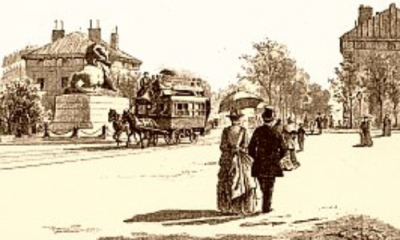 The fountain was moved the short distance from its original site on the nearby rue St Denis sometime after this. From Denfert - Rochereau it's just a short walk to le cimetière du Montparnasse which for many visitors is the outer limit of the quartier. 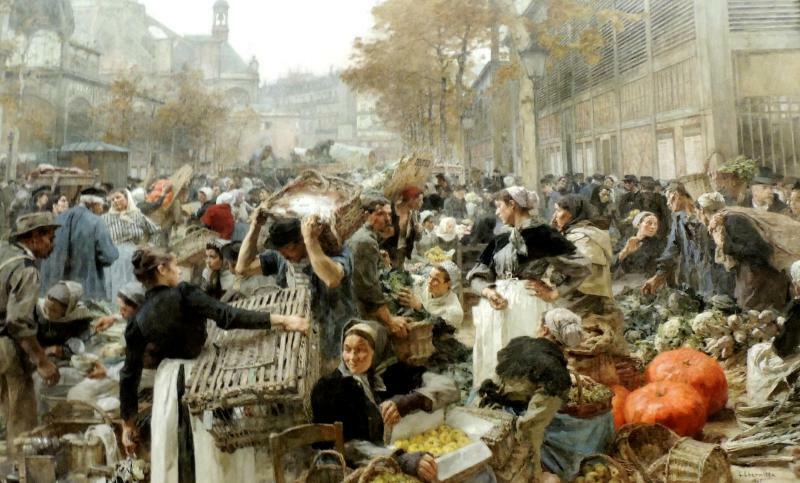 To be entirely fair, all that is shown on the maps of Montparnasse is a bewildering maze of streets stretching south; on the face of it there appears to be little of interest but in many ways those back streets bisected by the massive Avenue du Maine are the essence of Montparnasse where real people go about their lives amidst any number of atmospheric bars and quirky shops which are usually "open all hours." Many of these shops would never survive in the England of today but they are a reminder of an Englishness which no longer exists when "corner" shops lit up the streets with welcoming window displays and played an integral part in the community. Very few tourists ever visit the Parc Montsouris which remains a Montparnasse neighbourhood park but once again it is a reminder of a fast-vanishing England and is everything that a Victorian park used to be. 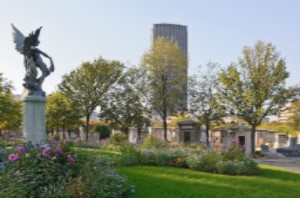 Anyway, for the time being the subject is le cimetière du Montparnasse which apart from everything else is a vast, free sculpture garden where the angels and cherubs and classical statues are as interesting as anything shown in an art gallery with ingenuity and humour well to the fore. 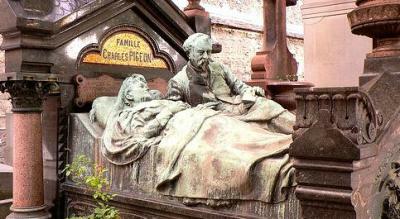 La Famille Pigeon is a superb snapshot of Belle Époque Paris showing financier Charles Pigeon and his wife in their bed. Even though we may find it difficult to admit, most of us have a fascination for wandering round cemeteries especially if they are old and more especially if they are home to the rich and famous - le cimetière du Montparnasse is both old and choc-a-bloc with celebrated Parisians, most of them originating from the Left Bank; just a few of the better known are - the chronicler of Belle Époque suburban angst, Guy de Maupassant, author of Les Fleurs du Mal, Charles Baudelaire, Frédérick Bartholdi of Statue of Liberty fame, Jean-Paul Sartre whose view of the world still baffles us, Irish playright Samuel Beckett, the actress Jean Seberg and 60's icon Serge Gainsbourg, with arguably the most interesting of all being that of Alfred Dreyfus whose grave would have been on Devil's Island if not for Émile Zola's intervention and immortal "J Accuse !." 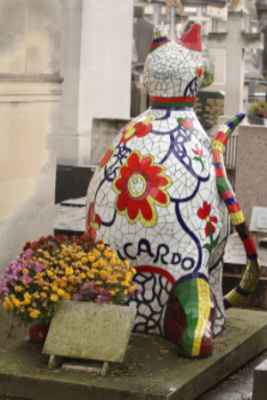 Modern art and humour in the form of Ricardo Menon's cat compete with classical statues in Montparnasse. 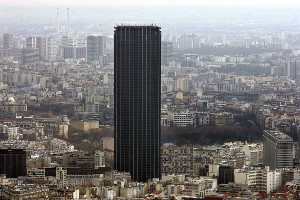 In the picture above, the Montparnasse Tower can be seen in the distance standing above every other building at 690 foot tall. Built in 1973 the Tower has always been a source of controversy among Parisians. From a personal point of view I think the Tower is an example of steel and glass architecture which has sprung up all over Europe from the 1970's onwards and in common with most of them the Tower is singularly unlovely and purely functional looking uncannily similar to the Monolith from a Space Odyssey. Totally out of context, if the Tower has any merits at all it is to remind us that the surrounding streets and buildings of 19th century vintage are far superior in every way. The Tower was built on the site of the old Gare Montparnasse which had in common with all other Parisian railway stations a certain charm which is irreplaceable. The original station on the left has been replaced by the monolithic structure on the right which dominates the landscape. 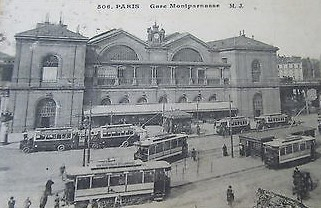 The old Gare Montparnasse was built in 1840 and became infamous for an incident in 1895 when the Paris - Granville express was thundering along trying to make up for lost time. 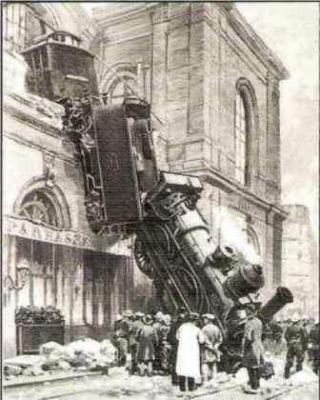 The train entered the station far too fast and combined with a failure of the braking system spectacularly went through the building and fell onto the Place de Rennes 30 feet below. The only fatality was a lady below killed by falling masonry. The station was also the place where Gen. Dietrich Von Choltitz surrendered the city to General Philippe Leclerc in August, 1944. The gigantic horse in the front garden which can be seen from the road. Reinforcing the vast gulf in architectural integrity between the old and the new architectural styles and tucked away among the side-streets is a building which houses one of the gems of Montparnasse; the building was once the workshops and household of Antoine Bourdelle (1861 - 1929) and is now Le Musée Antoine Bourdelle. Unlike the Rodin Museum there's no charge for entry to the Museum and best of all there are never any of the lengthy queues which are a feature of the Rodin Museum. It puzzles me that even among people only slightly interested in sculpture Rodin is a household name, yet Bourdelle is virtually unknown when his work contains as much if not more quality than Rodin's. There are similar examples of this phenomenon throughout the art world and I have a theory that the fickleness of critics influences people more than it should. However, in a strange way, Bourdelle's atelier has far more integrity than the Rodin Museum, which is a little anodyne and has lost its original earthiness. Antoine Bourdelle was born in Montauban in 1861 and came to live in Montparnasse in 1884 when the street was called Impasse du Maine and the area was a rural backwater. Interestingly, one of Bourdelle's neighbours and friends in L'Impasse du Maine was Jules Dalou who was a great sculptor in his own right. Dalou's work can be found in the Luxembourg gardens, Le Petit Palais and at Place de la Nation where the jaw-droppingly enormous Triumph of the Republic dominates the centre of the massive roundabout. 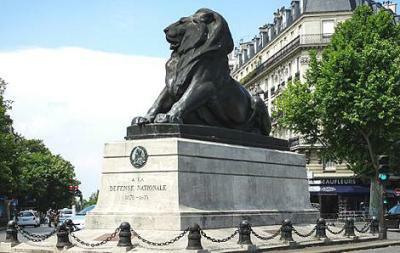 Some of Dalou's works can also be found in London where he was exiled in 1871 after allying himself too closely with the Commune of 1870 and in particular with Gustave Courbet who ruined his life and career when he took part in the destruction of the statue of Napoleon in the Place Vendôme. Dalou returned to Paris in 1879 and continued working until his death in 1902 when he was buried in le cimetière du Montparnasse. Thankfully Bourdelle was too young to have taken part in the Commune insurrection and he came to Paris when it was full to the brim of artists, writers and sculptors whose works are now famed across the globe. Bourdelle first attended the Ėcole des Beaux Arts in the rue Napoleon but became exasparated with its rigidity and concentrated on making a living by selling his work in the art salons and exhibiting in order to sell - one exhibition was set up with the help of Dalou in the Closerie de Lilas of all places. In 1893, Bourdelle was hired by Rodin as an aide in turning the sculptor's creations into reality working in bronze and marble, and in the same year he was commissioned to create a war memorial in Montauban for local men and women who had died during the Franco-Prussian War. The work took a decade to complete and was criticised by many who expected a classical theme and were presented by a study in Modernism. The same could not be said of Bourdelle's Heracles, Archer, first shown in 1910, which became an instant success spawning many replicas, one of which is on the upper floor of the Musée d'Orsay and another in the New York Metropolitan Museum of Art. The front garden row of statues. Another replica of the Archer -this time in the vast room which is necessat to house the huge statues. The bas-relief casts in the background replicate those on the Théâtre des Champs-Élysées. One of Bourdelle's admirers was Gabriel Thomas the director of the Musée Grévin. 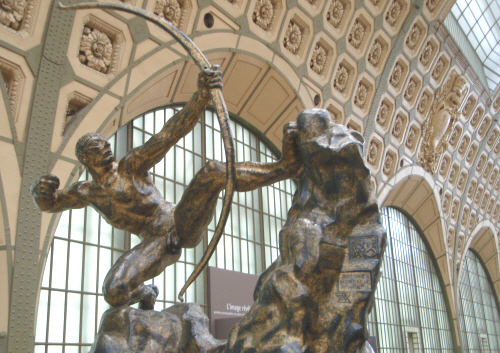 Thomas purchased a replica of the Archer and commissioned Bourdelle to create the bas-relief decorations for the Théâtre des Champs-Élysées near to the pont de l'Alma which opened in 1815. The resulting bas-reliefs are for many Bourdelle's finest work and replicas can be seen at the atelier. A strange aside to Bourdelle's time working at the theatre was a tragedy involving Isadora Duncan (1877 - 1927) who had been a model for Bourdelle on some figures in the bas-reliefs. Renowned as one of the finest dancers of her generation, Isadora,was stricken with grief when in 1813, a motor-car containing her children, Patrick, 6, and Deirdre the baby crashed into the Seine killing both children and their governess. Isador vowed never to enter a motor vehicle ever again but she did and was herself involved in several crashes. It was truly ironic that in 1927 she met her own death by a motor-car when one of her trademark scarves caught in the wheels of a vehicle she was waving off outside the Negresco in Nice. 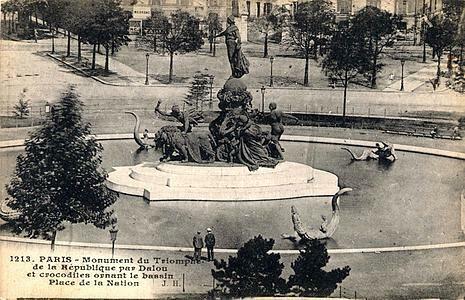 The Triumph of the Republic shortly after it was completed in 1899. Sadly, the area is now run-downand the basin and crocodiles are long gone. Although Montparnasse was changing and losing its rural roots Bourdelle was never lured by the bright lights and continued to create in his atelier where critics argue over which is his finest work - they never seem to understand that it's all a matter of taste. Bourdelle was commissioned to create many sculptures for public spaces which are necessarily huge and their replicas in the comparatively small Museum and the gardens make it appear that the visitor is walking among giants. The workshop at the heart of the building is replete with tools and a turn-of-the-century atmosphere pervades the workspace where everything is all of a jumble, making it appear as if Bourdelle has just gone out for lunch. 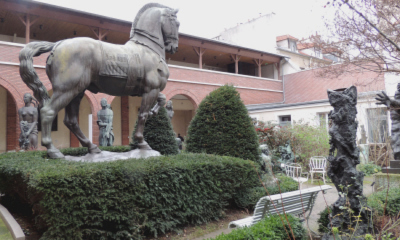 Le Musée Antoine Bourdelle is one of the least visited in the city and also one of the finest in the city - if you do go then be careful not to look for L'Impasse du Maine the street is now fittingly rue Antoine Bourdelle. The Archer in the Musée d'Orsay. As Bourdelle's life was nearing its end during the 1920's the Montparnasse that he knew so well was changing from a rusticated idyll into a haven for writers and artists of every stripe and with them arose restaurants, cafés and bars which they were not slow to frequent. 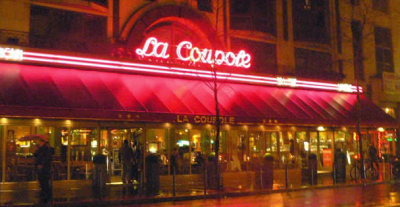 The most famous of these are all to be found on the Boulevard du Montparnasse - Le Dôme, Le Select and La Coupole (see the top of the page) being the most famous. All three restaurants retain the aura of the ghosts of patrons past - Hemingway, Sartre, Simone de Beauvoir, Picasso, Man Ray. John Dos Passos, Henry Miller, Josephine Baker, Edith Piaf, Jim Morrison and many others - and although "celebrities" still visit, for many patrons just being in the company of the shades of yesteryear is satisfactory. 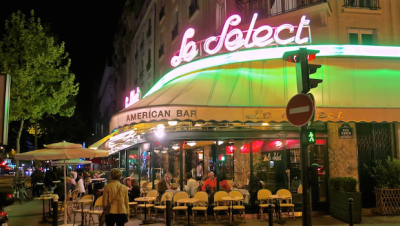 If you are still in the mood for striding it out on the streets of Paris, Boulevard du Montparnasse is a fair challenge and if you do manage to keep going then sooner or later you will reach La Closerie de Lilas, where we started out.